“Blessed are you who are poor, for yours is the kingdom of God” (Luke 6:20). This bold opening to the Sermon on the Mount sets the pace of a manifesto that continues to riddle me with seeming contradiction. The other day a young pregnant girl came to me begging for food. “I haven’t eaten in three days!” she explained. Every day we meet some 20 children who live on the streets. They arrive with torn clothing, failing shoes and bruised bodies. How can I affirm that these poor ones are blessed? “For the poor you have with you always; but you do not always have Me” (Matt. 26:11, Mark 14:7, John 12:8). These words of Jesus often are quickly cited when discussing Christianity and the Poor. Unfortunately, we are usually displaying our ignorance and siding with the disciples who thought that the money “wasted” on Jesus would be better spent on the Poor; or we are making ourselves feel better about the fact that the poor exist and that we do so little about it. Those –like me –, who read Jesus’ words from the perspective of the dominant culture, use the poor as objects of their patronizing pity or excuses for not giving at all. Though I do think that the existence of the poor has value in that God invites us to meet Him in the presence of the poor, I do not think we understand Jesus’ words in context. Jesus is quoting from Deuteronomy 15:11. “For the poor will never cease to be in the land; therefore I command you, saying, ‘You shall freely open your hand to your brother, to your needy and poor in your land.’” (We should take special note of the possessive pronoun that precedes the poor and the synonym “brother” which implies that the poor are part of our responsibility and family.) But the poor are not always with us merely so that our hands remain open. A few verses prior God states, “There shall be no poor among you, since the Lord will surely bless you in the land which the Lord your God is giving you as an inheritance to possess” (Deut. 15:4). There should be no poor among us. Yet, God knows the wickedness of our hearts and the power of greed. He knows that this will cause poverty, but He commands us to bring them into our families and give to them. If we obey, there will be no poor and we will be freed from our greed. If there are to be no poor, then why does God bless the poor? Why does God bless something that He forbids? If we look to the Church of the New Testament, we see that God faithfully moves His people to jubilee. “For there was not a needy person among them, for all who were owners of land or houses would sell them and bring the proceeds of the sales… (Acts 4:34). A sign of the presence of God in His Church is that there are no poor. Then, we must ask, why are the poor blessed? There is nothing romantic about the brutality of poverty: starvation, powerlessness, ignorance, and death. The poor are not blessed because they are poor but because the Kingdom is theirs. “God loves the poor with a special love because they are poor and not necessarily because they are good. The Beatitudes tell us more about the goodness of God than about the goodness of the poor. They reveal a Go’el God, defender and protector of the real-life poor, those deprived of what is necessary to live as human beings. It is this condition that makes them the preferred people of God” (Gutierrez). The privilege of the poor, then, has its theological basis in God. But there is also a blessing in the culture of the poor. I do not say this so that we spiritualize the words of Jesus. “If we ‘spiritualize’ the gospel message about the poor…and maintain that the ‘poor’ in the gospel are first and primarily the ‘spiritually’ poor rather than plainly and simply the materially poor…then we have an easy time with God. We ‘humanize’ God. We make him more accessible to human understanding. Now God will love, first and foremost, the good, the ‘meritorious’ – just as we do ourselves” (Gutierrez). 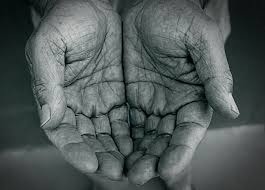 The poor are not blessed because they have a virtuous culture but because the Kingdom manifests itself in their midst. The blessed recognize their need for God and recognize their dependence on God. The blessed are free from commitments to the world. The blessed see how much they have to give out of the little that they have. The blessed value people, relationships and gratitude. My hungry friend, who is a pregnant street girl, is blessed because the Kingdom is hers. Her poverty is not romanticized or glorified. Rather, it is forbidden. OK, if you are in a hurry and have been readily reading through this article up to now, then I advise you not to read the rest. So, seriously, put it down and I won’t be in the slightest bit upset. The essence of what I wanted to say has been said. Hereafter, I want to draw your attention to two ways our skewed logic about the blessed poor have affected society. But this will take a little bit of space. The first is that the poor lost their blessedness to the Church. The second is that we have objectified the poor. The early Church knew that God loves the poor. A pagan historian reported from pre-Christian Rome that the Christians cared not only for their poor but for all of Rome’s poor as well. In fact, the theological question for the Church of the day was not “why are the poor blessed” but “how can the rich be saved” (Clement of Alexandria). Unfortunately, the Church gradually surrendered their responsibility of caring for the poor to the state. Kings and governors took charge of social programs. Of course, the Church often led the way in developing care for the poor, but the centrality of the blessed poor was lost. The Reformation furthered this loss. When the reformers did away with monasticism and almsgiving as ways to gain heaven by works, they also did away with the need for obedience to economic matters. The Enlightenment followed the path of the Reformation. The enlightened thinkers divided church and state and made the state responsible for its poor. In countries like England, the Church had great influence in the decisions of the state, but the poor remained the responsibility of each city. Unfortunately, this social policy changed as cities became more industrial and more capitalistic. The basis of capitalism is the free individual. But when a society makes the individual the central category, it quickly sacrifices equality and marginalizes anyone who cannot compete. The sanctification of democracy, capitalism and individualism has left the church wondering why the poor were ever called blessed. It is people in Britain who can talk on Finnish mobile phones, use Japanese cameras, drive American cars, drink Colombian coffee and wear clothes made in Asia. It is poor people everywhere who can buy cheaper food and clothes produced abroad. It is Indian computer programmers who can sell their services to American companies, and earn enough to give their children a good education and decent health care. And it is poor people in poor countries who are grasping the opportunities provided by trade and technology to try to better their lives. Mexican farm hands who pick fruit in California, Bangladeshi seamstresses who make clothes for Europeans…They and countless other real people everywhere are the human face of globalization. I want to comment on these words. Many would say a loud amen to Moore’s myopic optimism. Regrettably, I know few poor people who can buy imported products. Implicit in the word “poor” is lack of money, power and access. The young pregnant street girl I know only gets more depressed when she sees the imported food and clothing that she cannot buy. Also, I wonder if Mr. Moore knows about exploitation of coffee farmers in South America or the amount of aid the U.S. government gives to Colombia each year. Concerning the globalization of labor, I would introduce Mr. Moore to the Indian computer programmers I know. They are either working long hours for wages incomparable with their western counterparts, or they have joined the brain drain and have left their families and cultures so that their families can survive the industrial age in which a minority flourishes. I agree that the poor are resilient and try to use global trade and technology to their advantage, but this is rarely possible for the truly poor. Frankly, I cannot believe that Moore would draw our attention to Mexican workers in the U.S. or Bangladeshi seamstresses and call it a good thing. Their hard lives prove that the development is built on the backs of the poor and oppressed, and as long as capitalism is driven by greed and a lack of ethics, the trend will continue to worsen. The human face of globalization, I am afraid, is brutalized and dehumanized. At least Mike Moore makes no qualms about the company he keeps: It is not just Wall Street traders, management gurus, everyone who enjoys a comfortable pension and foreign investments, and “international civil servants like myself who gain from globalization.” I am of the opinion that we devalue terms like “civil” and “servant” when they are applied to people who share Mike Moore’s views. But I am painfully aware that when we benefit from a structure – be it good or evil – like global capitalism, we will paint its effects with beautiful colors only so we can continue to reap its benefits. Reality bites when we see that we are the benefactors of such a system, and the effects on the poor are brutalizing. When Jesus speaks, we need to listen. When we don’t, the effects are disastrous for society. The Church can no longer throw off the Beatitudes because she thinks them too idealistic. For it is evident that the Church loses relationship with the poor and objectifies them when she does not understand why the poor are blessed. The very real sign of our misunderstanding are street girls that get pregnant before their time and go for days without eating. But God says to her: You are blessed! The Church needs to walk with her and help her discover this blessing.